Gordon Holsinger is a rather fortunate fellow. Whenever Historic Racing Miniatures (HRM) prepares to release a new product, he is usually the one to build the first production unit that gets used as a demonstrator at model car shows. 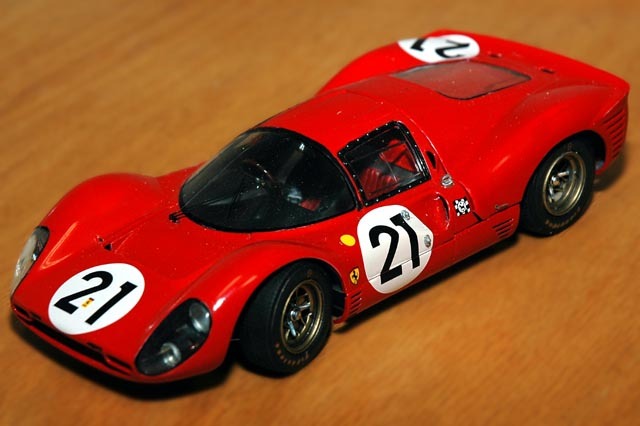 Such was the case when HRM developed their Ferrari 330 P4 engine detail kit for Fujimi's well-executed, but curbside, Ferrari 330 P4 kit. Gordon's build-up of the HRM engine kit traveled to several shows, enticing many a modeler to buy one for themselves. Now Gordon has expertly fitted the built-up engine kit into his own Fujimi Ferrari 330 P4 kit.